To-day, 2018 09 22 is a Very Special Day for all Shufflers, but especially for Canadian Shufflers!!! The very first Secretary of the CNSA, and wife of the very first President of the CNSA, will celebrate, and I mean celebrate, her birthday to-day in Orillia ON. Daughter Jan Scheidt confirmed the celebration which will take place where Peggy lives. Pic on left is of Peggy and husband Jack. Jack left us 11 years ago on Sep 23rd. I am now going to insert an article about Jack which I had published in their newspaper. 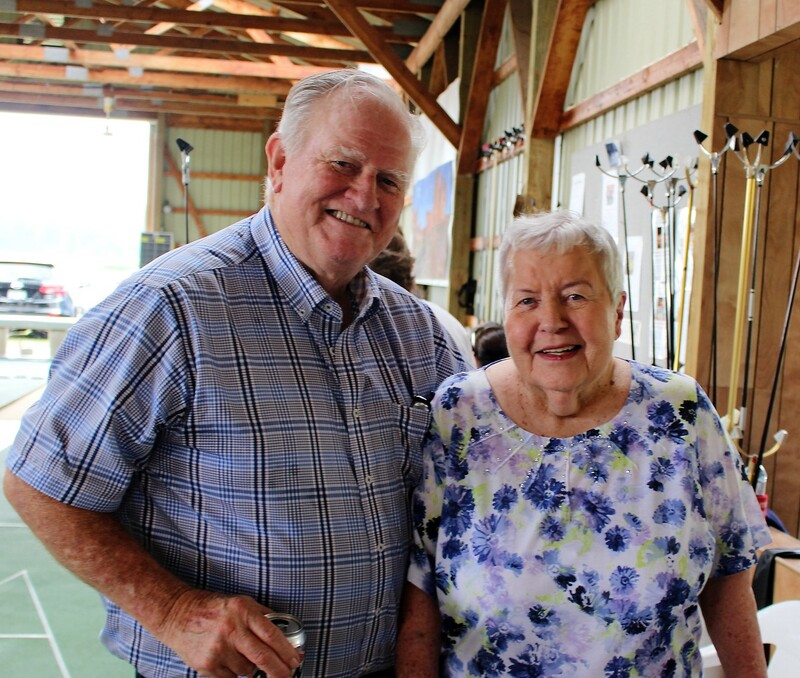 STONEY CREEK CITIZEN INTO NATIONAL HALL OF FAME Pic of Peggy and Glen (Peltier) taken at Tilbury, ON in 2016. Stan McCormack speaks for all Shufflers when he extends to PEGGY HOUSE, the VERY BEST on this very Special Day!! PEGGY: You have a most distinguished record in Shuffleboard. PEGGY: You will be remembered long after your life on earth. Peggy House was the first shuffleboard player in the history of International Competition (37 years) to achieve “Two Perfect Records”!! Her first came in Texas at the 4th ISA Event and her 2nd on the 10th Anniversary of the ISA in Lindsay, Ontario. In total Peggy competed in 7 ISA Events. Peggy was instrumental in the formation of the CNSA, became its very first Secretary and held that office in the formative years from 1981 to 1985. She played for the Canadian Women’s Team at the very first ISA of 1981 in Muskegon, MI. 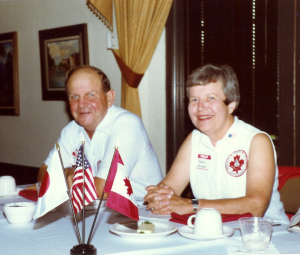 Peggy served on the Organizing Committee for the 1990 Lindsay ISA event making regular commutes from her residence as required. Contributing to the camaraderie of International Shuffleboard, following the Lindsay event the House Family entertained the Allen Family, the Nidys and the entire Japanese Team at their home in Stoney Creek, ON. Stan McCormack, former President of the CNSA. Today is Rita Coy’s birthday also. She is now 98 years young. Saw her and Bennie yesterday and she looks great! When I told her she looks great her comment was, “Oh, Pat, thank you, I don’t even have any makeup on!” Cute!! Thanks Pat. That is a Milestone for sure. All the Best to Rita.